I’ve decided that I’m officially obsessed with the garlic scape pesto I made. We’ve eaten it (together and on our own) atop of fresh bread, tortellini, and in sandwiches. It’s so fresh-tasting, less garlicky than typical pesto, and, well, is just awesome. Another flavor combination that really screams summer to me is the ‘caprese’ salad, a basic combination of tomatoes, basil, and fresh mozzarella. I had the tomatoes laying around, as well as the mozzarella; both were probably going to go bad in the coming days, and needed to used up. I figured, why not use them with the pesto? Spread 1 tbsp pesto on a slice of bread. Add tomatoes, then mozzarella. 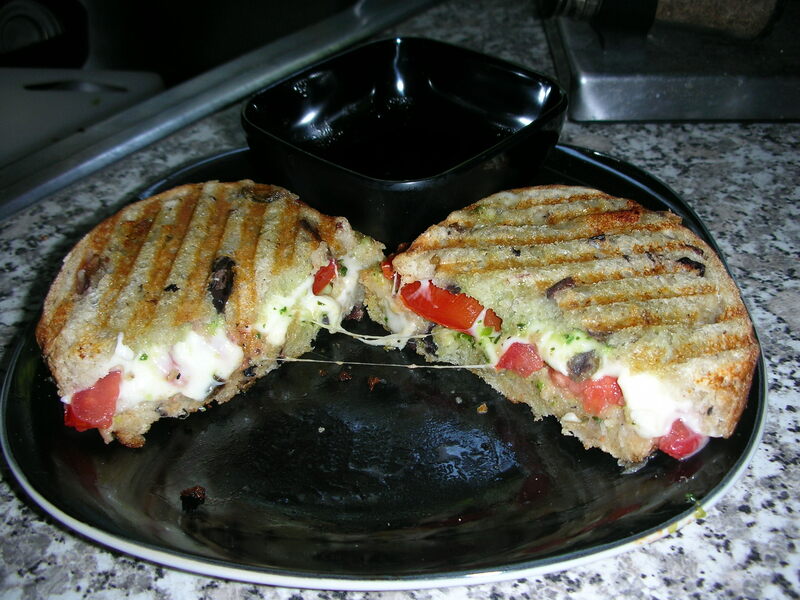 On a heated panini press or grill pan, sprayed with cooking spray, grill the sandwich until the mozzarella melts. The panini, atop rosemary-olive bread. Divine. Today is another blessed day off from the bakery, and instead of writing drill for marching band, I’m going to play around in my kitchen some more. I’m going to try dabbling in the art of refrigerator canning…look out! Question of the Day: Are you a fan of pickles, let alone pickled vegetables?